Have you ever hollered your kid's name through the back screen door because it's dark out and they were supposed to be home for dinner 20 minutes ago (or maybe because they're wearing headphones and can't hear you holler that dinner's ready even though you're only two inches away from their face) and thought to yourself, "What the hell was I thinking when I picked this name? Also, what does this kid have against dinner?!?" I happen to love all my kids' names, but I almost wasn't so lucky. My first child came three months premature, and although there'd been much name-related deliberation during the first two trimesters, we hadn't yet chosen The Best Name Ever. On the day he was born, under intense pressure from one of those nurses with the Social Security forms who was clearly trained by SWAT interrogation experts, we hastily settled on the name that most often hovered toward the top of the baby name list—a name that later proved to be more common than the acronym "WTF." It turned out fine—after all, my stacks of baby name books assured me that boys thrive with more common names! However, recently I've started thinking all my children could benefit from from a little creative sprucing up in the name department. Because, without a doubt, the most challenging part of parenthood is choosing a name. Sure, some people will tell you that the hardest part is getting a baby to sleep through the night, or that sending a child off for the first day of kindergarten is the absolute worst, or that the duration of a preteen's pubescence is like a horrible waking death. But deep down, everyone knows that the struggle to pick a name trumps all those hurdles. No contest. Think about it. Your baby's name will follow him around for his entire life. He'll hear it every single day. A name helps define how your child sees himself, and will immediately affect how other people perceive him. On top of that, it's all but impossible to change later. What other single decision you make as a parent carries that kind of weight? The pressure! As parents, we search for names that are equally suitable for a business person, an artist, or an admiral in the Navy—after all, we don't want to limit our angel's options! We carefully consider the spelling, ensuring it's neither too boring nor impossible to pronounce. Will it conjure up any negative assumptions when seen on a resume? Will it inspire a rhyming nickname that'll be chanted on the playground until your darling babe is inflicted with irreparable psychological damage? Is it too feminine? Too masculine? Does the monogram inadvertently spell out something dirty? As much as I love the first/middle name combos I find myself screaming daily from the bottom of the stairs when my children refuse to come down for breakfast in an even remotely timely fashion, I must admit I'm a little jealous of the artistic license I see being taken with celebrity babies' names. Indiana August Affleck? Sage Moonblood Stallone? Moxie Crimefighter Jillette? FUN! Hoops Galore Welling: Destined for athletic stardom. Max Velocity Welling: Please—that's just badass. Langston Pennyweather Welling: How could this kid not be rich? Will he get beat up a lot? Yes. But also, he'll be rich. Wittle Winnie Wynter Welling: SO PRECIOUS! Paddox Seven Welling: I bet Angelina Jolie would adopt Paddox7 (alternate spelling) before I was even finished pushing him out. DoritosPowerade AppleGoogle Welling: Perfect for a corporate sponsorship—and my early retirement. Efinsgove Hosfutt Welling: I just made that up by typing with my eyes closed. But after doing some research, I'm pretty sure that's how most celebrity baby names get picked, anyway. Hmm, I suppose I'll just stick with my kids' regular old non-celebrity real people names for now. But what about you? 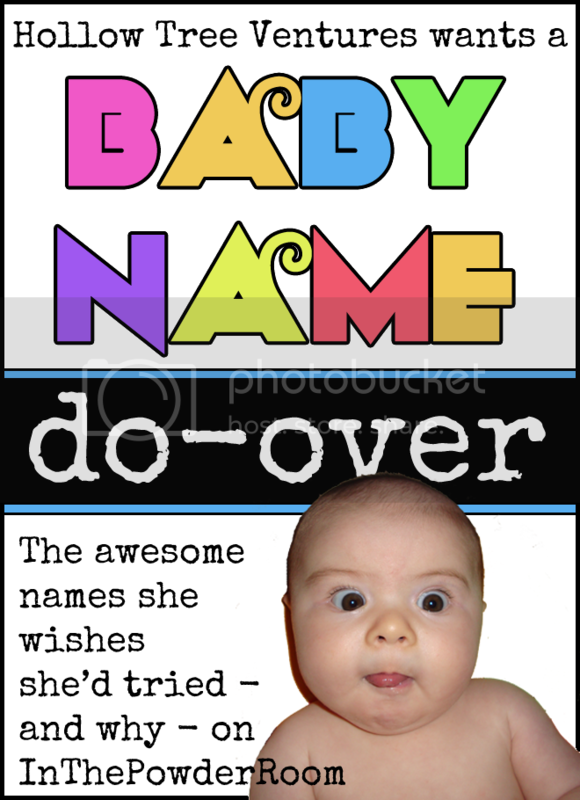 What would you rename your kid if you had the chance? A version of this article originally appeared on In The Powder Room and is republished with permission.